The group’s work ultimately resulted in a large-scale (45’ x 80’) permanent site-specific mural titled Sign Language. The image was inspired by a photo from Martha Cooper’s – “Street Play Project” (1978), her eloquent photo series that poignantly captures the resiliency of inner-city youths amid the bleak backdrop of a blighted 1970s New York City. Sign Language spans upward from the 2nd to the 7th floors of 267 Pacific Street in full view from the busy intersection of Smith Street and Atlantic Avenue in Brooklyn. Street artists Chris Stain and Billy Mode led the Cre8tive YouTH*ink group of apprentice artists through all aspects of mural making – engaging them in the process of planning and producing a large-scale public art project. 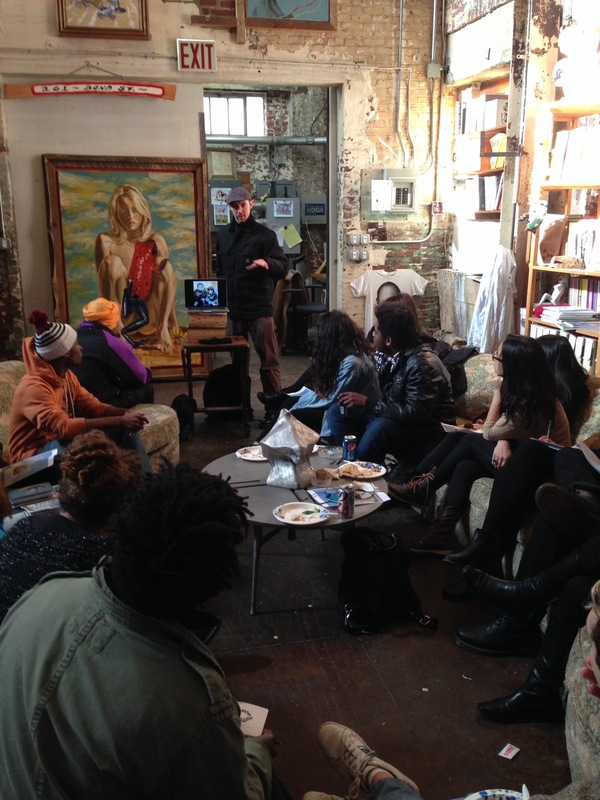 Pre-production meetings took place at the Ray Smith Studio in Gowanus, Brooklyn. Production took place at the group’s temporary headquarters, a large studio in the Industry City Complex located in Sunset Park, Brooklyn. Chris Stain grew up in Baltimore. He was introduced to art through graffiti – via books like Subway Art by Martha Cooper and Henry Chalfant, movies like Wild Style, Style Wars, Beat Street, and rap records that featured graffiti lettering on their covers. Starting with the printmaking he learned in high school, Stain later adapted the stenciling techniques for which he has now become well known. Reminiscent of the American Social Realist movement of the 1930s and 40s, his large-scale stencil street art aims to dignify the struggles of unrecognized and underrepresented people in society. Stain currently teaches art in New York City’s public schools and is pursuing a degree in Art Education at Queens College. Recent commissions include Annie, a mural for Columbia Motion Pictures in New York, and Betting on Someday, painted at Aqueduct Raceway in Queens with Katherine Huala. Billy Mode is a Baltimore artist who credits his personal style to his early training in 1980s graffiti movement. His other influences include sacred geometry, micro/macrocosm parallels, and designs that exist in nature. Mode fuses these concepts with words and phrases from songs, lectures and conversations to create mathematically influenced modular structures that communicate thought-provoking messages. He uses his stencil concepts to create large-scale outdoor murals as well as experimental paintings in the studio. Mode and Stain are childhood friends who have worked together often. Her seminal book Subway Art (Holt Paperbacks, 1988) has been hailed the “Graffiti Bible,” but it is her photo essay book Street Play (2005) that best reflects her commitment to capturing the scrappiness and creativity with which inner-city kids make the best of their surroundings. 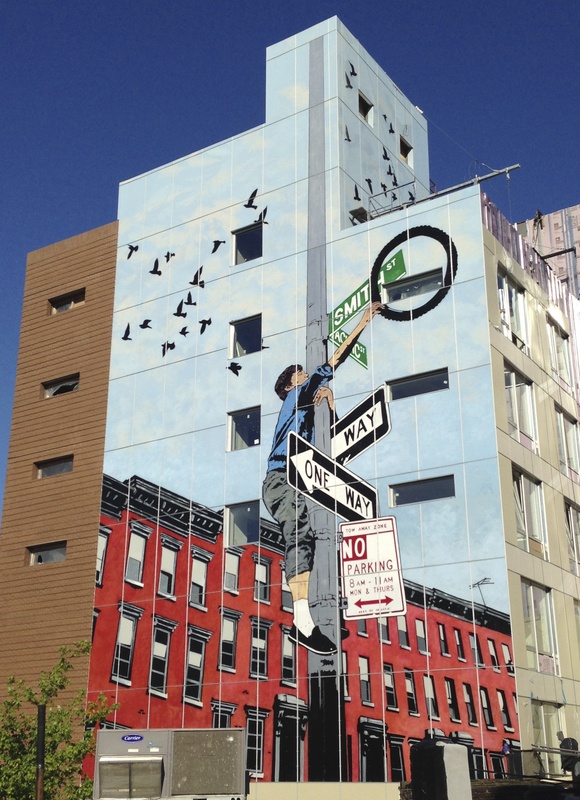 She is especially taken by the resourcefulness of those “making something from nothing.”The current mural project is inspired by Cooper’s photo of a teenage boy climbing a street lamp pole to retrieve a bicycle tire. It is just this spirit of creativity and aspiration that is reflected in Cre8tive YouTH*ink’s Art School Without Walls projects.